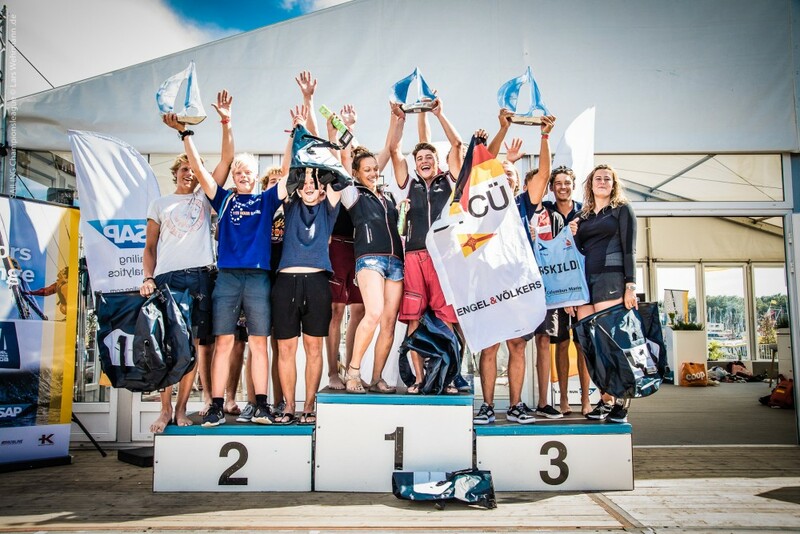 Three days of intense competition and a nailbiting four-boat final sees Bodensee Yacht Club Ueberlingen from Germany win the first ever event in the Youth SAILING Champions League after a stellar performance in Travemuende, Germany. Kongelig Dansk Yachtklub from Denmark is runner-up ahead of fellow Danish team from Roskilde Sejlklub in third place. Not only was this the first SAILING Champions League event aimed specifically at sailors aged between 16 and 23, it was also the first time a new race format – the four-boat final – has been tested. For the front group, the final day was all about making sure you had done enough to make it through to the four-boat final. After twelve flights with 36 races, the final was a battle Denmark vs. Germany: the Kongelig Dansk Yachtklub (KDY) and Roskilde Sejlklub from Denmark against Bodensee Yacht Club Ueberlingen (BYCUe) and Lindauer Segler Club from Germany. This new Finals format means that your overall position from Qualifying is taken into the Final Series. So as winner of the Qualifying Series, KDY carried through a first place and hence already one race win. Whichever of the four clubs secures two race wins would become the overall champion. In the first final race, BYCUe won, putting them level with KDY, the winner of Qualifying. The other two yacht clubs were really starting to feel the heat, desperately needing a win in the next race. In final race 2, BYCUe earned her second race win, giving the young crew from Germany the overall victory. Over the three days, the clubs experienced all kinds of wind conditions: from Freaky Friday, with the wind averaging 17 knots and gusting quite a bit more at times with big waves – it was a day to hang on to your hats – to lighter airs on Saturday and Sunday putting a greater emphasis on tactics. Next weekend, the league competition continues with Semifinal #2 of the senior circuit of the SAILING Champions League. The event is hosted by St. Petersburg Yacht Club in Russia from 3 to 6 August, just a few weeks before the 2018 Final which will be hosted for the first time by Sailing Club St. Moritz, high up in the Swiss Alps from 30 August to 2 September. Did you miss the races of Youth SAILING Champions League? Just visit sapsailing.comand click through the SAP Sailing Analytics for replays of all races and different and interesting statistics about the action on water. You find the overall results on sapsailing.com!